Can your information be accessed ?? Can you give me any infromation on the above?? Hi would you be able to help me find out about. Unit Text: "K" Coy. 3rd Bn. Special Bde. Additional information: Son of Andrew and Elizabeth Creswell, of 33, Windmill Terrace, Londonderry. He was born in Liverpool and had originally joined the army earlier in the war in the Royal Field Artillary service No 56669 however after allegedly receiving field punishment he transferred to the Royal Engineers (or would that have been Pioneer Corps due to his rank?) I remember seeing one photo of Willy on horse back but sadly I don't know what happened to that picture. I do however still have 2 photos of him one in his RFA uniform, complete with spurs ( in the photo he is stood with a sailor but sadly we don't know who he is), and one in his RE uniform with his 'bomber' badge on his right sleeve. I have no idea why he was awarded the MM, have you come across anything in your investigations? Also have you come across the events around Willy's death possibly at the Battle of Lys. Other information I can give you is that Willy played the accordian and the officers clubbed together to buy him an instrument so he could entertain the men. Strangely Willy had worked on the clipper ships before the war but chose not to join the Royal Navy. His memorial is recorded on a plaque is the Florence Institute for Boys, Mill Street Liverpool (currently being renovated), Willy had been a member of this institute but his name is written as 'William Hardacre' (his mothers new married name) due to Willy's mother's new husband seeing him as his own son. Hope this is of some help to you, if you need anymore information please get in touch. Thanks for remembering these men. Many thanks for your contribution. I don't have any details for him, but I can find out. 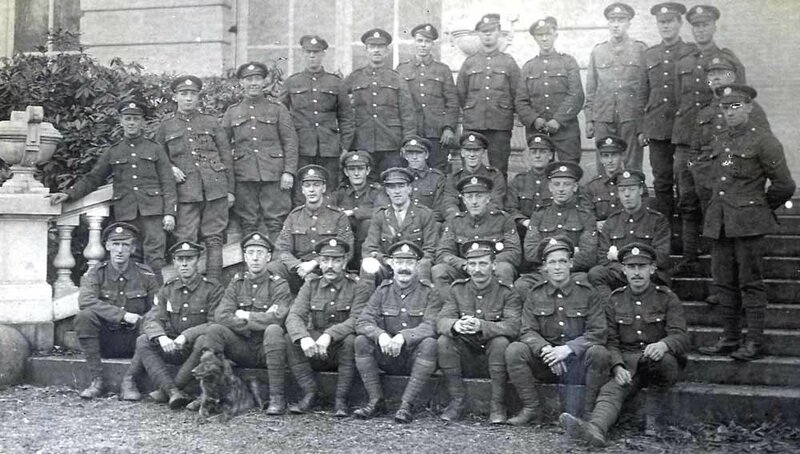 About a thousand men from the Royal Artillery were transferred to the SB. No 1 Company was equipped with 4 inch Stokes Mortars, almost certainly the reason why this RFA man was transferred to them. Your "bumping up" of your query reminds me, now that I am back in the UK and have access to old files, to give you what I have re my grandfather. He was Sergeant William Barr, RE, no. 106515 (I have his identity disc), M Special Company. He entered France 17/8/1915, discharged to class Z, 10/2/1919. I do not have his medals, sadly. He died in 1959, three years before I was born. I did review, back in 1996, the relevant War Diaries for M Special Coy (WO95/332, 401, 486 and 549), but found only one reference to him by name, teaching chemistry just around the end of the war, presumably to help the lads on their discharge. He was originally a chemistry teacher, hence, I assume, his original drafting into the Specials. In 2000, I visited a couple of the locations in Belgium and France where M Special Coy conducted attacks...truly scary to find the roads and farms they attacked still extant. I only have one piece of ephemera relating to him - a photocopy of an informal poster (A3) of "M Special Company's strafes", the original went AWOL somewhere within the family. This was presumably produced within the unit at the end of the war. But it lists about 50 attacks, with date, locality, division (i.e. in support of), number of cylinders or projectors discharged. I can post this as a photo if that would be helpful (no scanner currently I am afraid) or snailmail it to you if interested. I also have, albeit bought separately from a book dealer some years ago, a copy of "Gas warfare : monthly summary of information", No.2 August 1917, issued by General Staff, a small pamphlet only c. 16pp. Again I could post jpegs or send you photocopy by snailmail if interested and if you do not already have it (as I suspect you do). The only other piece of memorabilia I have is an RE sweetheart brooch, which he gave to his fiancee during the war. What is also nice is that I have a lovely photo of her wearing it (see attached photo, with the brooch and also his identify disc). Having (a long time ago) been a TA Sapper, I have used this as a tie pin on suitable occasions. I would be very interested to hear any information you have on the below chap. Secondary Unit Text: attd. "O" Special Coy. Additional information: Son of Walter and Mary A. Thompson, of Ely, Cambs. Grave/Memorial Reference: 1. B. 9. Thanks for that, any information on Willy would be great. Its nice to see part of his life being pieced together. Did you see my post 124 on this subject. I have hit the proverbial brick wall with regard any more background on George Dawson. a six month waiting list for a full response. Sorry, I did miss your post apologies to you and anyone else I haven't replied to yet. I'll trawl through the last few weeks and reply sooner rather than later. Unit Text: "H" Special Coy. Additional information: Son of William and Millicent Loggie, of 4, Glendalough Rd., Drumcondra, Dublin. Junior Assistant to Professor Gilbert Morgan, Royal College of Science, Dublin. Grave/Memorial Reference: I. K. 34. This is William Thomas Keith Loggie, my uncle. My mother always said he was a victim of 'friendly gas' as it might be called now. 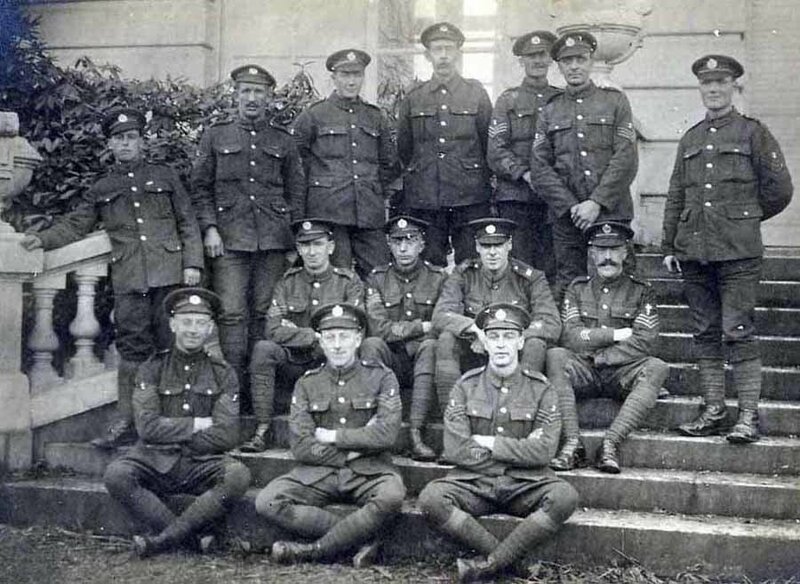 Maybe you could point me to what this unit was doing in July 1917? My father, George Oswald Mitchell (G.O.M. ), was also a sergeant in 'M' Special Coy RE. He kept a trench diary up to the Battle of Loos and notes of engagements thereafter. I have checked through his trench diary and notes, but unfortunately there is no specific mention of your grandfather. I have also checked through the signatories of the menu of 'M' Special Coy's annual reunion dinner in 1932, but again I am afraid your grandfather's signature is not there. I have used G.O.M. 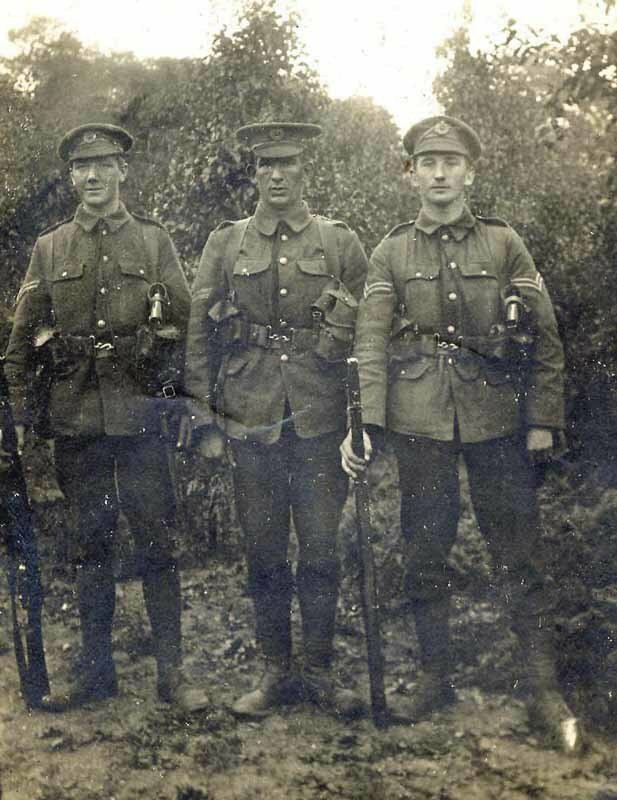 's trench diary and notes as the basis of a book that has been published recently, Shrapnel and Whizzbangs - A Tommy in the Trenches 1914-18, which deals partly with 'M' Special Coy's experiences - see the 'books by members' section of this website, or http://www.shrapnelandwhizzbangs.wordpress.com. A possible source of information for you is the run of the Special Brigade Newsletters held by the RE Library at Chatham. However, these are not reproduced or digitalised and you have to visit personally, having made prior arrangement with the Librarian. It took me two days to work through them - a very moving experience. I would be fascinated to see the poster of 'M' Special Coy's strafes if you can find any way of posting or attaching it. Alternatively, if you can have a copy made and post it to me I would gladly pay any expenses involved. 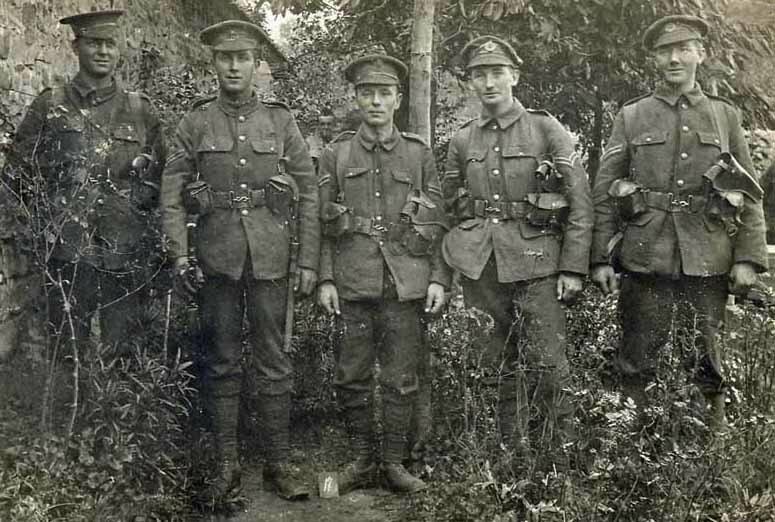 Do you have any casualties for 3 Battalion, Special Brigade, who might have died as a result of a gas attack near Messines on the night of 31 Aug-1 Sep 1916? I've reason to believe this was a British attack that went wrong. One man who was affected and invalided home was Lt C D Stewart. Although invalided out of the Army in July 1918 he appears to have survived a long time - the last date I have for him is 1937 in Hong Kong. I'm not interested in names, just whether there were other gas casualties in 3 Battalion. I've ordered Foulkes' book "Gas! The story of the Special Brigade" from my library. I know of three from the battalion who were killed. The difficulty arises with the wounded. There is a lack of detailed records from that period and if they suffered adverse effects just 24 hours or so after that, there is the additional problem of proving that they were casualties from the same incident. I have noted this though and if I turn anything up I'll let you know. The information about the fatalities is very useful and places what I know about Stewart in context. I appreciate what you say about those wounded as Stewart himself obviously survived. With apologies for delay, only just seen this - fascinating ! I very much appreciate your efforts to find references to Sgt Barr in your father's materials. He seems to have kept a low profile ! But I am sure the two men must have known each other. I will definitely have a look at your book, which I had not come across before. It will at least give a flavour of things. I may sometime get a chance to look at the newspaper at Chatham. Re the 1932 reunion, I don't believe he kept much in touch after the war, my mother never mentioned anything, in 1932 he would have been teaching in Aberdeen. I can now attach some pics of the "poster", one of the whole thing and two of three of smaller sections (ran pout of space for final bit), although I fear at the sizes allowed here it may be unreadable. If you can PM me your snailmail address, I am very happy to mail it to you (just one page under A3). Again, many thanks for an unexpected surprise ! I am seeing my mother (his daughter, still going strong at 81) tomorrow, and she will be fascinated to hear there is a book that might at least describe some of M Special's work. I've some Special Brigade (I think) photos - my Grandfather is on most of them. I hope that this posting works . . .
OD Winterbottom of Horton House, Northampton. And here is another Special Brigade photo. A Special Brigade Photo, but not of the best quality. there is at least one soldier with just one stripe (Is that Lance Corporal ?) and those standing at the back of the group don't appear to have any stripes at all - but I thought that soldiers in the Special Brigade were Corporals ? 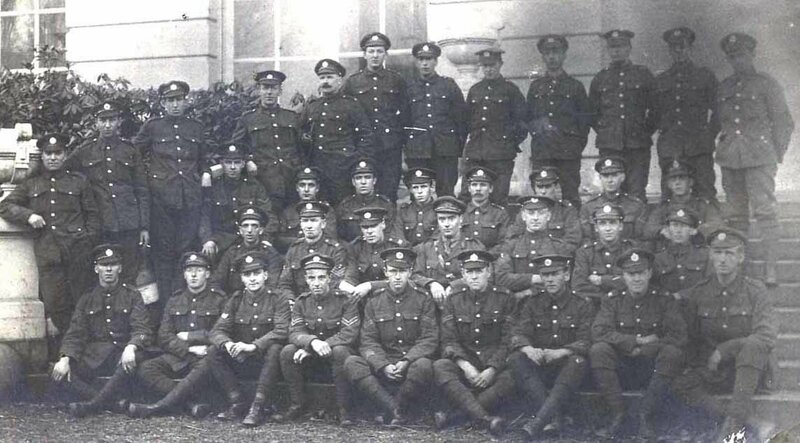 A smaller group of the Special Brigade in the same location - but where ??? 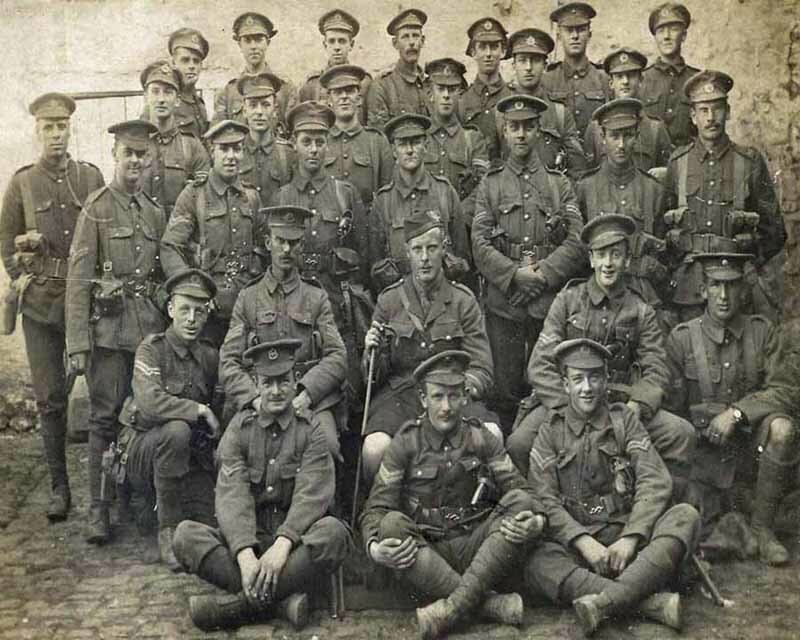 The group is mainly of Sergeants, my grandfather is 3rd from the left of those standing. Again, there is at least one soldier with no stripes.